Enter the Edward M. Dowd Art and Art History Building at Santa Clara University and one is immediately confronted with "Feral Fence", a Trumpian-inspired, monstrous, twisting armature. Through this border wall, visitors gain access to powerful, multi-media works: horrific and impactful, hopeful and reverential, abstract and emphatic, poetic and conceptual. An altar to those who lost their lives in transit. The alarming lengths to which people go to stay together as families. The dehumanization at deportation centers. The voices of youth as they make sense of their new homes. The strength that comes from fragile individuals bonding together for survival. A call to action. The exhibition "Beyond Borders: Stories of im/Migration" by the curatorial team Gutfreund Cornett Art and their group of international artists, sheds light on the personal and observed narratives surrounding the struggles of flight, immigration, assimilation, deportation, and the perception of being “other" in American society. The works acknowledge the dignity, dreams and sacrifices of these people and reflect on where we are going, individually and as community with shared desires for hope and home. Gutfreund Cornett Art believes art can transcend language barriers, strengthen understanding, stimulate greater compassion between displaced people and the communities that receive them, move us to action and advocacy and create visions for a new, more inclusive society. February 2, 2018 4-5 p.m.
Artists talked about their motivations & inspirations followed by a conversation with the community. This format is a powerful opportunity for us all to reconsider, to delve further, to acknowledge individuals instead of headlines and to expand dialogue and understanding around issues of immigration, migration, assimilation and deportation. February 2, 2018, 5 - 8 p.m.
​Introduction of artists, further conversation, music by the Bay Area band "LoCura," which blends flamenco, Cuban son, reggae, cumbia and ska to make its own revolutionary party music! "Changing the World Through Art at Santa Clara University"
“We’re honored to be able to facilitate these kinds of discussions that are so timely and have a big impact on our community,” said Studio Art lecturer Julie Hughes, who welcomed attendees to the Salon. "Beyond Borders: Stories of im/Migration"
Interviews with our Beyond Borders artists Tessie Barrera-Scharaga and Shannon Wright. "​All of the pieces are approached with such poignancy and thoughtfulness, it may take a few visits to really get the inspiring and equally heartbreaking effect that Beyond Borders hopes to achieve. . . The curators are working to foster a deep appreciation of what it means to be a person trapped between, and subsequently at the mercy of, two worlds." Art Exhibition: "Beyond Borders: Stories of im/Migration"
Beautiful film produced and directed by April Morland, Morgan Mahre, & Avery James as a social justice project for their Santa Clara University filmmaking class with visuals from our "Beyond Borders: Stories of im/Migration" exhibition (up through April 6th). Poems ("Nomenclatures of Invisibility" by Mahtem Shiferraw and "Maps" by Yesenia Montilla) paired with details of works by Carlos Cartagena (Estatuas de Sal), Diane Kahlo (Crossings/Travesías), Doerte Weber (Checkpoint Carlos), Erin McKeown/Stephen Brackett/Shawn King (The Jailer, Part 2), Gala Narezo, Shamina de Gonzaga and Chantal Fischzang (MEXUS), Julio Cesar Morales (Boy in a Suitcase), Kathryn Clark (New Home), Priscilla Otani (Our Hearts Beat As One), Shannon Wright (Feral Fence), Taraneh Hemami (Absence; from the Hall of Reflections Series), Tessie Barrera-Scharaga (Cartography of Longing). As an artist with a long history of producing work based on the idea that art can shed light on controversial issues, it was incredibly affirming to participate in Beyond Borders: Stories of im/Migration, the latest show organized by the curatorial duo of Karen Gutfreund and Sherri Cornett. It has been a long held belief in many art circles that art should exist only for art’s sake, independent and untouched by what happens in the world around us. In the current political times, this seems like an unbelievable waste of creative potential. 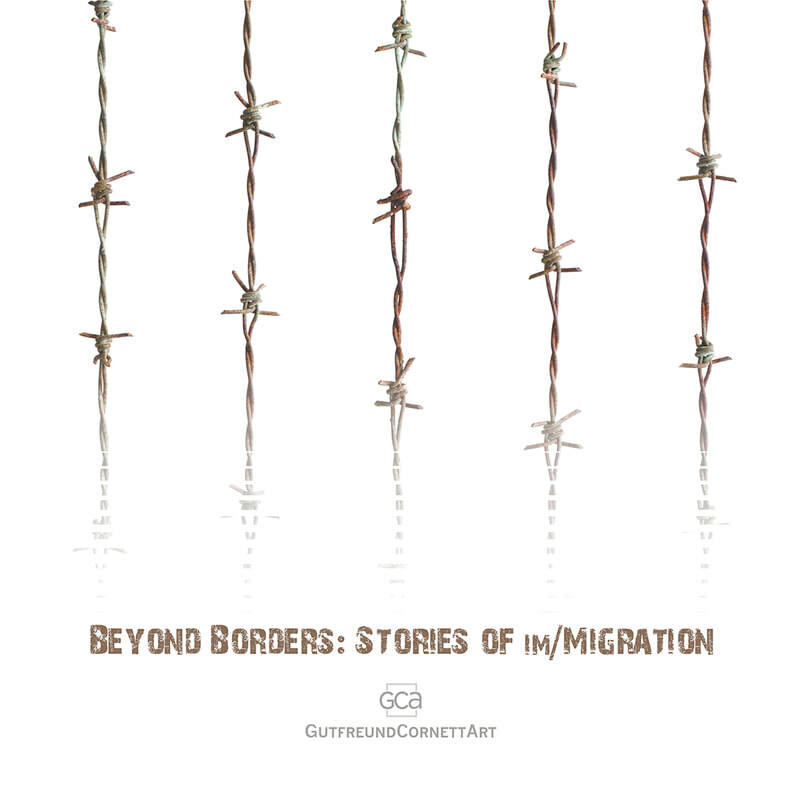 Beyond Borders is powerful for the many aspects of humanity shared in its artist’s stories, which in turn provide a better understanding of the multitude of ways people’s lives are affected by migration. Gutfreund and Cornett have combined their expertise and are blazing a path with their powerful vision and their passion for contextualizing and organizing art shows with an emphasis on activism. Our times demand a strong voice from the arts, and these women deliver! Migration is a topic that is hard to make people react to since it is a recurrent conversation. People easily could forget that if we are still here talking about it is because the migratory factor is still here. The causes don't disappear but get worse. As you know, one of the most harmful things of a systematic scourge is the normalization. So, thanks a lot for being with us saying, "No, the criminalization of migration is no right, and is not natural". I wanted to thank you so much for hosting my Senior Capstone course for a tour of the exhibit on Thursday. Having your engaging descriptions of each piece – with thought provoking questions – as we went around added so much to it, and of course having Shannon and Tessie there too was really rich. I can tell that the students were taking it in. . . Having this visual/audio/physical content alongside the content of the course really allows the topic to settle in – or be integrated – in a whole new way, and I know that it will continue to be something that our students will work for and with as they move forward beyond SCU. It has been a pleasure to be curated into the imMigration exhibition. Thank you Karen and Sherri for creating this exhibition. This is a compelling subject matter with so many families threatened and separated today. To have ICE agents invade our sanctuary State, standing outside schools and court houses capturing people with no criminal record, and sending them back to a hostile country is horrific. It is important to put a face and a personal story for each and every affected person so that no one can dismiss what is going on as irrelevant. Activist artists need exhibition opportunities like this to help the voiceless. Working with Karen and Sherri on this exhibition was a very positive experience. Their unique vision for the show was wonderfully developed, and they were dedicated to helping the artists in every way they could. I was very impressed by the other work in the show, and hearing from the other artists in the Community Conversation was inspiring. Located in the heart of Silicon Valley, Santa Clara University blends high-tech innovation with a social consciousness grounded in the Jesuit educational tradition. The university is committed to leaving the world a better place. They pursue new technology, encourage creativity, engage with our communities, and share an entrepreneurial mindset with the goal is to help shape the next generation of leaders and global thinkers. The Main Entrance to Santa Clara University is 500 El Camino Real, Santa Clara, California. 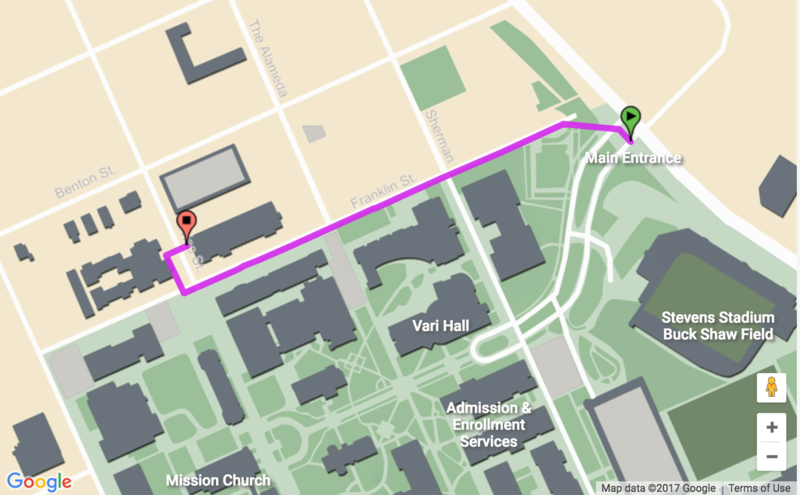 From the main entrance, please consult the map at right or for personalized directions to the gallery, please go to SCU Map It. Every vehicle must have a valid parking permit visibly displayed between the hours of 6 a.m. and 8 p.m., Monday through Friday. A permit is not required on Saturday, Sunday, or University holidays. Daily permits are available from the Main Gate kiosk, which is located at the University's main entrance. Visitor parking lots are at the red X's on the map to the right. Katherine Aoki, Art and Art History, Chair 2015-2018, Associate Professor; Dr. Laura Chyu, Lecturer, Public Health Program; Kelly Detweiler, Art and Art History, Professor, Summer Chair; Michael Farrell and Steel & Fence Supply; Andrew Hedges, Art and Art History Department, Laboratory & Facilities Manager; Pancho Jimenez, Art and Art History, Senior Lecturer; Kori Kessler, GCA Curatorial Assistant; Dr. Kathleen Maxwell, Art and Art History, Professor; Takeshi Moro, Art and Art History, Assistant Professor; Kathleen Schneider, Art and Art History, Senior Assistant Dean; Dr. Craig Stephens. Director, Public Health Program, Professor, Biology Department. Office, Public Health Program.